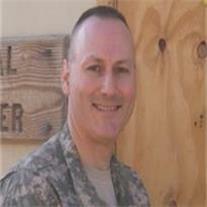 Michael Anthony Vincent, 51, passed away May 16, 2012 in Gilbert, AZ. He was born October 4, 1960 in Brockton, MA. He was a Maricopa County Public Defender and in the Army Reserves US Army JAG. He served honorably in Afghanistan and received the Bronze Star Award. Michael loved to serve others in any capacity that was needed. He loved life and spent as much time as possible with those he loved. He is survived by his eternal companion Velora, children Jeni, Taylor, Bandon and Velora; father Jerry Vincent; mother Barbara St. Jean; siblings Wendi Nasser, Donna Smith, David, Christopher and Ryan Vincent and many friends. Funeral services are Saturday, May 26, 2012 at 10 AM at the LDS Church at 1150 W. Elliot Rd. in Gilbert. Arrangements by Bunker’s Garden Chapel.